Let’s look at OWL Slider and Cookicode/starter theme as an example. Cookicode/starter theme uses Luma parent theme. First step is to download OWL slider and all the required libraries for it. File “_owl.less” contains official css for OWL slider used in our example. 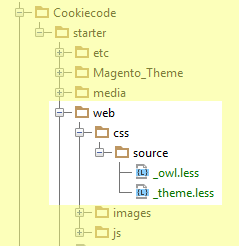 Next step is to import “_owl.less” file in to “_theme.less” file. We use file “_theme.less” due to Magneto 2 fallback mechanism. File will be merged and compiled with the same file name from the Luma theme. We need to define path for our custom component (custom JS library). With this step we have finished configuration of JS library. Next step is creating custom container through the XML and call the slider into that container. In this file we’re going to add container named “top.slider”, the container will be shown after the container “page.top”. Please pay attention to the “require([” part of this block. This way we define which libraries are required for our block/plugin. Thanks for this – very useful and detailed. Is there a reason you could not use jQuery from the Magento library rather than uploading your own version in your theme? there’s no reason. I just wanted to show how we can load external library through RequireJS. You can use there “jquery” default library. But thanks for question. Nice article, i am not step to code yet, but i see your explain is really good, i hope i can complete this by follow your. This is a nice article. But i want to use jQuery in Magento lib. How can i do this? I am a newbie in Magento 2. I am using parallaxslider in my website and i want the default magento 2 jquery to be used. Can you tell me how to add them. I had followed this link but I am getting jQuery not defined. Great post! I also would like to know how I can use the default jQuery from Magento library instead of loading an external library. Such a complicated use of custom js library, comparing to Magento 1. Hello! Link files not work. Please write where can I get the source files. Thank you! 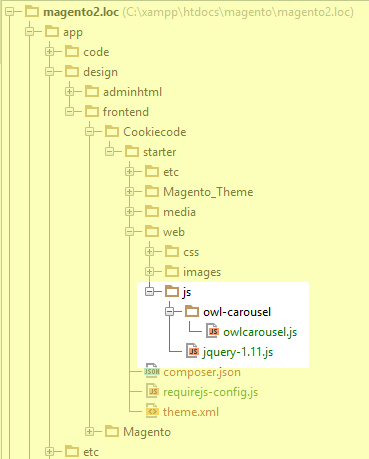 Changes to the code owlcarousel.js are required. Only create requirejs. “shim” – it indicates addiction. Can you post a article on how to use owl in custom module.